EFMC has recently established two Prizes for young researchers in Academia and Industries. The first winners are Andreas Bender, currently Lecturer for Cheminformatics, Unilever Centre for Molecular Science Informatics, University of Cambridge (Academia) and Antonio Nardi, currently at Grünenthal, Aachen, Germany (Industry) We congratulate with the two winners and offer them space for presenting their scientific activities and their labs. Dr. Antonio Nardi (1976, married, two children) graduated at the faculty of Pharmacy of Pisa University in 2001 (Italy), awarded the same year with the Virdis prize as outstanding graduate and obtained in 2005 a PhD in medicinal chemistry from the same university. Throughout the course of his doctoral studies (2001-2004), first under the supervision of Prof. Biagi Giuliana at the Department of Pharmaceutical Sciences in Pisa (www.farm.unipi.it/scieweb/) and later under the supervision of Dr. Rodriguez Sarmiento Rosa Maria at the Pharmaceutical Division, Discovery Chemistry at Hoffmann-La Roche AG in Basel (Switzerland) (www.roche.com), Dr. Nardi had the opportunity to come into contact with diverse drug targets and a number of therapeutic areas. His main research interest, though, focused on the design and synthesis of structurally novel heterocyclic compounds as modulators of potassium channels, especially the large-conductance calcium-activated potassium channels (BK), and their potential therapeutic application in cardiovascular diseases. His research efforts in this field were then further advanced at NeuroSearch A/S (www.neurosearch.com) (Ballerup, Denmark), a biopharmaceutical company focused on unmet medical needs and a well-known and recognised pioneer in the BK channel field. Dr. Nardi first served there as a post doc and subsequently as a research chemist leader for the BK channel programme (2005-2010). His work has resulted in the design of modulators that are currently among the most potent BK channel openers (whose status cannot be fully disclosed) as well as in the identification of new tool compounds (such as NS11021 and NS13558) that are currently the basis for scientific collaborations with several American and European universities and research centres and by which the therapeutic potential of BK channels in conditions as diverse as ischemia, chronic obstructive pulmonary disease (COPD), erectile dysfunction and overactive bladder is currently investigated. One of such research centre is the Danish Arrhythmia Research Centre (DARC), in Copenhagen (Denmark) (www.darc.ku.dk), where he is currently appointed visiting professor in medicinal chemistry. At NeuroSearch, besides the research in the field of BK channel modulators, Dr. Nardi has also extended his scientific interests to positive allosteric modulators of nicotinic acetylcholine receptors, for which research programme he served as a research chemist leader throughout hit selection and advanced lead optimisation phase, as well as he had the opportunity to launch a new research programme in drug discovery, for which he served both as a chemistry leader and project leader. This program is to be considered distinctive in that it is carried out very much in opposition to the most classical paradigms of the modern drug discovery. Part of this uniqueness is due to the fact that only high-quality compounds, designed upon a semi-rational principle, are tested in a primary in vivo screening and their potential in a given therapeutic indication, irrespective of the molecular target(s), is explored by means of systems biology approaches. As per March 1st 2010, Dr. Nardi (antonio.nardi@grunenthal.com) has taken up a position within the Preclinical R&D division (Medicinal Chemistry) at Grünenthal (www.grunenthal.com) in Aachen (Germany) where he is currently Associate Scientific Director and serves as Project Manager of a research programme aiming at a novel type of ion channel modulators. Dr. Nardi has authored more than 15 peer-reviewed articles and is (co)inventor in more than 20 patent applications. So why should we use computers in medicinal chemistry? Well, there’s so much bioactivity data available which we can (and should) put to good use! There are times in life where you make consciously the right decision - but there are also those situations where a seemingly random choice turns out to be the exactly right one in hindsight. In my case, after studying chemistry at Technical University Berlin and returning from an exchange year at Trinity College Dublin, I had the summer after my year abroad off – and having been the decent student I was I decided to look for an internship in a related field. Now, originally I planned to work in South America in summer, but realizing the preparations required for this step I settled for an internship with a cheminformatics start-up close to Berlin instead, in Hennigsdorf, called CallistoGen. The nice thing about science is that you can move around relatively freely. Hence, for my Master’s Thesis I went to Goethe University Frankfurt to work with Gisbert Schneider on a bioinformatics topic; while for my PhD I moved to the UK to extend previous work on virtual screening algorithms at the Unilever Centre for Molecular Informatics in Cambridge / UK with Bobby Glen (which, in fact, is also the place I returned to just a few months back to assume a position as a research group leader). What I am very grateful for is a so-called ‘Presidential’ Postdoctoral Fellowship with Novartis in Cambridge / MA afterwards – it is a fantastic program, which allows the postdoc to do essentially three years of independent research, with all the resources a pharmaceutical company can offer. (‘Presidential’ here refers to the head of the research arm of Novartis, not ‘W’ in case you might wonder.) Given the independent research possible in this position, and under the direction of Jeremy Jenkins, we published more than a dozen papers during my tenure with Novartis, which allowed me to become an Assistant Professor with the Leiden / Amsterdam Centre for Drug Research (LACDR) before assuming my current position as a lecturer with Cambridge University. So why should ligand-based drug design methods be of interest in current days, with more and more crystal structure popping up in databases every day? Well – not only that both methods are often complementary, but there is simply such a lot of ligand bioactivity (and more generally, property) data out there which we can (and should) put to good use for future medicinal chemistry activities. To mention a few numbers: The ChEMBL database at the European Bioinformatics Institute (EBI) which was recently released publicly as one of the biggest databases of this type, contains more than 560,000 compound records with more than 2,700,000 experimental activities in its current release, spanning more than 7,300 targets. 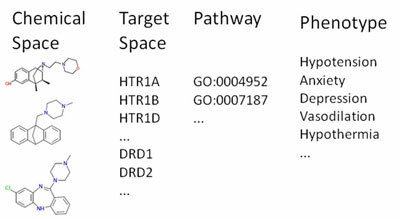 (‘Targets’ in this context might be proteins, but also phenotypic readouts such as ‘as ‘walking behaviour’ or ‘change in foot-licking latency’ which are surely some of the more interesting assays to perform). Also other properties, such as lipophilicity or solubility are of interest to the modelling community of course, but I have to say that, personally, I am most interested in the factors that contribute to the activity of chemical matter against protein targets. This type of data can now be used in multiple ways which are also pursued in my current research group in Cambridge, as well as previously in Leiden, termed ‘chemogenomics’ or ‘proteochemometrics’ approaches. These modelling methods take information about the ligand structure, as well as the target protein, into account in order to make bioactivity predictions. So why is this useful? Well, imagine you have a series of compounds, A1, A2, and A3, which you measure against target 1. At the same time, you know the activities of compounds B1, B2 and B3 against target 2 (see Figure 1 for an illustration). In classical models, you would need to generate two separate bioactivity models, one for target 1 and one for target 2, each of which covers only a relatively small area of chemical space each. However, if you knew how to translate bioactivities from target 1 into bioactivities against target 2, you would on the one hand cover more chemical space in your model (namely chemical space represented by all of the ligands above), and on the other hand you would learn to be able to extrapolate between targets 1 and 2. You are now thinking of ligand selectivity (or desired promiscuity) profiles against GPCRs? Or bioactivities against highly resistant mutants of viral enzymes? Then you move into the absolutely right direction - these are the typical areas where proteochemometrics research could be applied, and where we will release prospectively validated primary research results in the very near future. Figure 1. 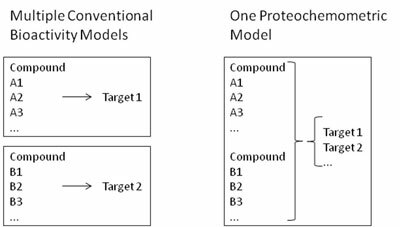 While for conventional bioactivity models one model per activity class needs to be generated, in proteochemometric models only a single model, covering all related protein targets at once, is required. Advantages are larger coverage of chemical space on the ligand side, plus the ability to extrapolate to novel, but related targets (the extent of which depends on the precise data given). As illustrated in this example, by employing chemogenomics principles – namely relating proteins by the similarities of their ligands - we can use ligand bioactivity data in a much wider way then before. This type of modelling, taking into account up to millions of data points, has applications that range from receptor deorphanization, to the prediction of polypharmacology of compounds against G-Protein Coupled Receptors, to the selection of the right HIV Reverse Transcriptase Inhibitor active against a particular mutant of this enzyme. Figure 2. By integrating chemical space with target and pathway annotations, plus a phenotype definition that depends on the particular study, the wealth of data available today can be used in both directions: to rationalize phenotypic observations of compounds (such as adverse reactions), as well as to influence phenotypes – the objective of every drug discovery programme. The above are only examples of the amount of knowledge and the versatility current bioactivity and pathway databases offer to researchers in the life sciences and I would be very happy to contribute with my experience in chemical data mining and retrieval to experimental ligand design projects in research groups anywhere in the world. Given our recent renewal of funding at the Unilever Centre for Molecular Informatics at the University of Cambridge we are currently heavily recruiting about 10 PhD students and postdoctoral fellows in and around the cheminformatics, chemogenomics and metabolism areas. If you are interested you are cordially invited to visit the Unilever Centre website at http://www-ucc.ch.cam.ac.uk/ or my personal departmental website at http://www.ch.cam.ac.uk/staff/ab.html for further information. Also of course, feel free to contact me directly by e-mail at Andreas.Bender@cantab.net if you would like to discuss options for joint research projects or if you are interested in joining our research groups.